Why did you decide to become a goalie over a player since you are already a good field player? Good question. My mother enrolled me in Karate lessons when I was 3.5 years old. At the time, I was the youngest kid out of diapers. They only accepted diaper-trained kids. I happened to be one of them after a trip to Kenya, one of many. I had to know how to use the toilet by myself. When we got back, we got a call from the Karate school inquiring if we were still interested. My mom said yes, and that I was toilet trained as well. I went to Karate 5 days a week for 45 minutes every day. Discipline is what we were taught. Being punctual and full dressed to partake on the exercise was key. I was already exposed to this from my moms military boarding school experience in Kenya. I knew what I had to do and did it. Being a goalie requires discipline. Karate training was one of my first ways of learning what discipline meant. I was ready. Four years later, I fell in love with Soccer and left Karate. No questions asked from my momma. I became a goalie after two summers of playing out field at Cherry Beach. I absolutely loved playing mid-field and striker positions. When I first tried goalie, it felt so natural. That was it for me. I loved it so much I had to negotiated with my mom who insisted on striker position. I remember telling her, this was “my calling.” She was not for it, but accepted. I am just honestly a better goalie because I like the challenge and I love our team. We are better together.. I don’t see losing as a bad thing. When the balls come through, I remind myself to think of the saves rather than the goals scored. Took my mom a long time to understand. Why I would choose to play goalie. She does now and supports me the best way she can. Grateful. 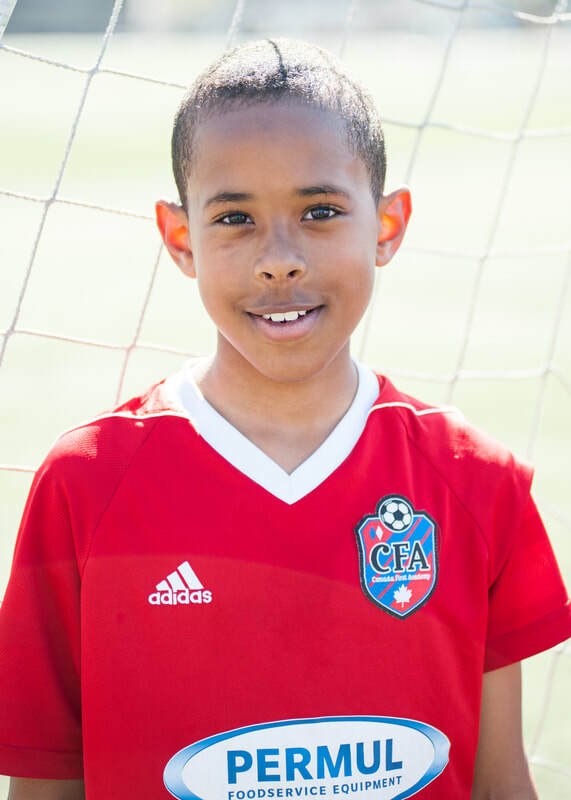 How do you think CFA has impacted your growth as a player? Being a CFA player and goal keeper, really is an honour for me. I would really love to go pro someday. What I love most about being a CFA player is the family unit. My mother is very big on chosen family. The coaches are excellent. The players are my friends and I just honestly love everyone. Having a good family, an awesome mom and people who support us as a family has been very important. CFA is well rounded and German as it may seem to some, the discipline I expect. Actually, I demand of our CFA team. Let’s go CFA!! Which soccer player do you respect the most and why? This is a hard question to answer for me. I have a lot of respect for Cristiano Ronaldo. I have read about his childhood with an alcoholic father who died when he was quite young. Ronaldo inspires me most because he said he has never had alcohol in his life and never will. I love DeRozan for that as well. Miss him. I personally hope to never drink or smoke in my life. My mom says, not to judge people at all. My favourite Goalie is De Gea even though I am an Arsenal fan. Amazing Goalie. I was disappointed when Brazil lost to Germany 2 world cups ago. Broke my heart. What do you like to do when you are not playing soccer? Hmmmmmmmmmmmm, I absolutely LOVE to play basketball. I think I am good at it and working on it. Not the best player at this moment, but come summer, I will get better.. Other than that, I love all sorts of sports. I like to watch Hockey, not play it. Baseball is some other sport that inspires me. I watch NHL, but not interested in playing at all. I take swimming lessons because my mom says I have to. Its honestly exhausting and makes me hungry. I am good at it though. She pays the bills. No? Yes? As a “tweenager,” I love my PS3/4 games. Most of my games are soccer or basketball. An occasional NHL or Minecraft. If it was not for the strict rules in my house, I would play this games 24-7. Just saying. Why do you prefer playing for CFA to another club? Because there is no other club I would rather play for. CFA is my family of choice. The very best!